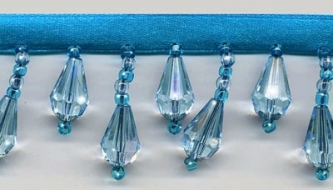 From our Beaded Drop Collection: This trim is in a bright and vivid turquoise blue. (If you are looking for more of a muted turquoise green take a look at Turquoise Ice.) This beautiful trim is a high quality, very full beaded fringe with exceptional detail and craftsmanship. The longer beaded stands are 1" long, not including the bright turquoise satin ribbon. You will love the way these beads sparkle in the light! Exquisite! Perfect for apparel or home decor.